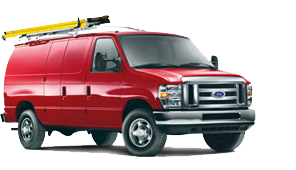 The 2012 – 2014 Ford E-250 cargo van equipped with the ROUSH CleanTech propane autogas fuel system will reduce your emissions and operating costs. With unparalleled performance and reliability, this transport freight reduces greenhouse gas emissions and uses a domestic fuel source — while maintaining horsepower, torque, towing capacity and range. Prepare to save with the innovative propane technology found in ROUSH CleanTech Ford E-250 cargo vans. ROUSH CleanTech liquid propane fuel systems are available to buy and equip on 2012 and newer model year Ford E-250s with the 5.4-liter V8 engine. Get your Ford E-250 retrofit today with a system that can be installed at any one of our conveniently located ROUSH CleanTech authorized installation centers. Make transporting cargo more profitable by driving a Ford E-250 propane-autogas-powered van. You’ll have the satisfaction of knowing you don’t have to pay sky-high prices to fuel your vehicle. That’s because propane autogas is 30 to 40 percent less expensive than gasoline. Visit the Savings Calculator to see how much money you can save by switching to propane autogas. Saving money and the environment doesn’t mean you have to compromise performance. The Ford E-250 cargo van equipped with the ROUSH CleanTech liquid propane autogas fuel system provides drivers with the same exceptional horsepower, torque and towing capacity of a gasoline-powered Ford E-250 (5.4-liter V8): 225 horsepower and 350 lb-ft of torque. Ford E-250 propane autogas cargo vans are specifically designed and tested to start and operate consistently and reliably in any kind of inclement or extreme weather condition from blistering summer heat to sub-freezing conditions. Propane autogas-powered Ford E-250 vans are known for their high performance and reduced maintenance costs, however, when this clean-burning vehicle does need servicing, standard Ford diagnostic equipment can be used at service centers all around the country. Visit the Dealer Locator to locate a service center near you, or call 800.59.ROUSH.